Just hours after a big win to become the GOP nominee for Florida governor, Republican Rep. Ron DeSantis went on Fox News Wednesday morning to say the last thing Floridians should do is “monkey this up” by electing his African-American progressive opponent, Andrew Gillum. "That last thing we need to do is monkey this up by trying to embrace a socialist agenda with huge tax increases and bankrupting the state," DeSantis, an outspoken supporter of President Trump, said on Fox News’ "America’s Newsroom." He continued, "That is not going to work, that’s not going to be good for Florida." DeSantis also described Gillum, who won the Democratic nomination for governor in an upset, as an "articulate spokesmen for those far left views," but said after watching Democratic primary debates, "none of that was my cup of tea." 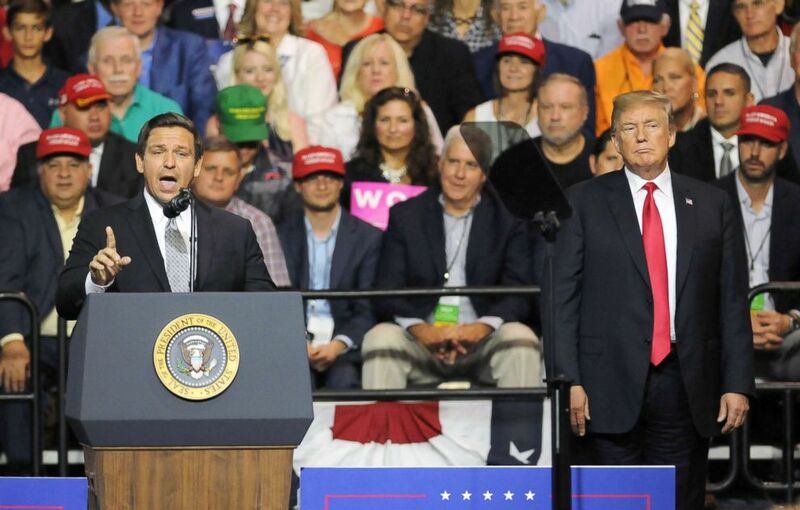 President Donald Trump listens to U.S. Rep. Ron DeSantis as he asks for the support of Trump voters in his bid to become Florida's next governor at a Make America Great Again Rally, July 31, 2018, at the Florida State Fairgrounds in Tampa, Fla. Reaction was swift, with Florida Democratic Party chairwoman Terrie Rizzo releasing a statement, saying, "it’s disgusting that Ron DeSantis is launching his general election campaign with racist dog whistles." The DeSantis campaign, however, said there were no racial undertones in his comments. "Ron DeSantis was obviously talking about Florida not making the wrong decision to embrace the socialist policies that Andrew Gillum espouses. To characterize it as anything else is absurd," Stephen Lawson, the communications director for the Ron DeSantis campaign, said in a statement. "Florida’s economy has been on the move for the last eight years and the last thing we need is a far-left Democrat trying to stop our success." Gillum was a guest on Fox News’ "Shepard Smith Reporting" later in the day on Wednesday. Apart from talking about his primary win and his policy thoughts, Gillum also addressed DeSantis’ earlier “monkey this up” comments. “It’s very clear that Mr. DeSantis is taking a page directly from the campaign manual of Donald Trump,” Gillum said. Gillum said he believes Florida voters will take note that DeSantis made these comments on the first day of the Florida general election campaign. Gillum also appeared on MSNBC and addressed DeSantis comments again, this time referencing the part where DeSantis said Gillum was an “articulate” spokesman for socialist views. Back in Washington, the president told reporters he had not heard about DeSantis’ comments on Fox News. Earlier in the day, Trump, DeSantis' biggest endorser, took to Twitter to attack Gillum’s record as mayor of Tallahassee. "Not only did Congressman Ron DeSantis easily win the Republican Primary, but his opponent in November is his biggest dream," Trump tweeted. Trump says Gillum is a "failed Socialist ...who has allowed crime & many other problems to flourish in his city. This is not what Florida wants or needs!" Fionna Beazzo stands with her mother Erin Beazzo as she fills out her primary day voting ballot next to Beverly Putzke at a polling station, Aug. 28, 2018, in St. Augustine, Fla.
DeSantis easily rode to victory against the establishment favorite, Florida Agriculture Commissioner Adam Putnam, Tuesday night after the president tweeted his support for DeSantis, a Jacksonville congressman, in June. Following the tweet, Trump also campaigned for DeSantis and his Senate race counterpart, Gov. Rick Scott, in Tampa in late July. Gillum’s winning the Democratic nomination, on the other hand, came as a surprise. For months, the Tallahassee mayor was trailing Florida political dynasty candidate, former Rep. Gwen Graham -- whose father was a beloved senator and also governor of the state -- as well as a number of wealthy and self-funding challengers. Late in the race, Gillum received the endorsement of progressive icon Sen. Bernie Sanders, the Vermont Independent, and a generous cash infusion from George Soros and Tom Steyer. Gillum is now the first African-American nominee for governor in Florida. 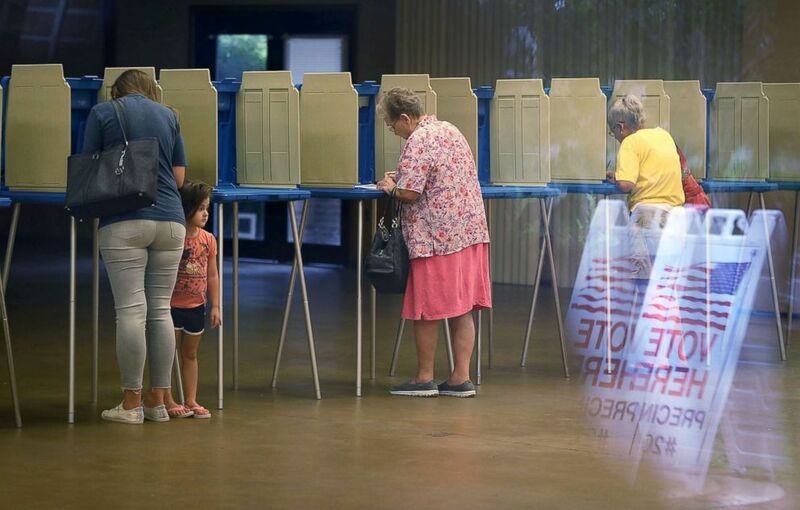 Voter turnout in Tuesday’s election broke records, especially in the race to elect party nominees for the governor's race. In total, 3.1 million voters went to the polls, 48.1 percent of them Democrats and 51.9 percent Republicans. The previous primary record was set in 2002 when 2.6 million Floridians voted.